Good Morning! 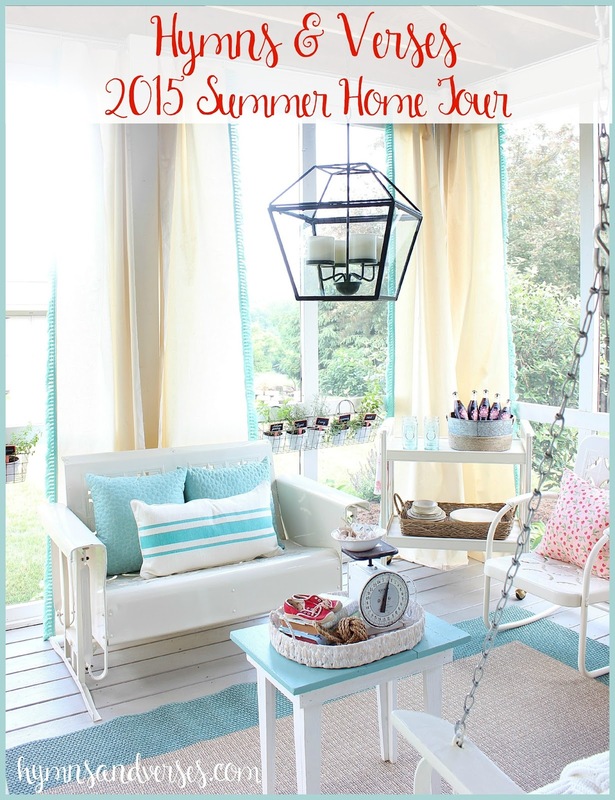 Welcome to my 2015 Summer Home Tour! Special Thanks to my friend, Marty from A Stroll Thru Life for inviting me to join this tour of 30 amazing blogger’s homes. If you are new here, let me tell you a little bit about me! 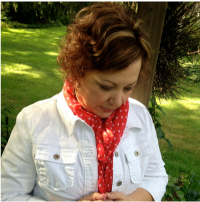 My name is Doreen and I grew up on a farm in rural central Pennsylvania. I currently live in Lancaster County, Pennsylvania, where seeing a horse and buggy clip clopping down the road is commonplace. My backyard backs up to a farmer’s field where currently corn is planted and soon will be sky high! Lancaster County is old time Americana at it’s best! 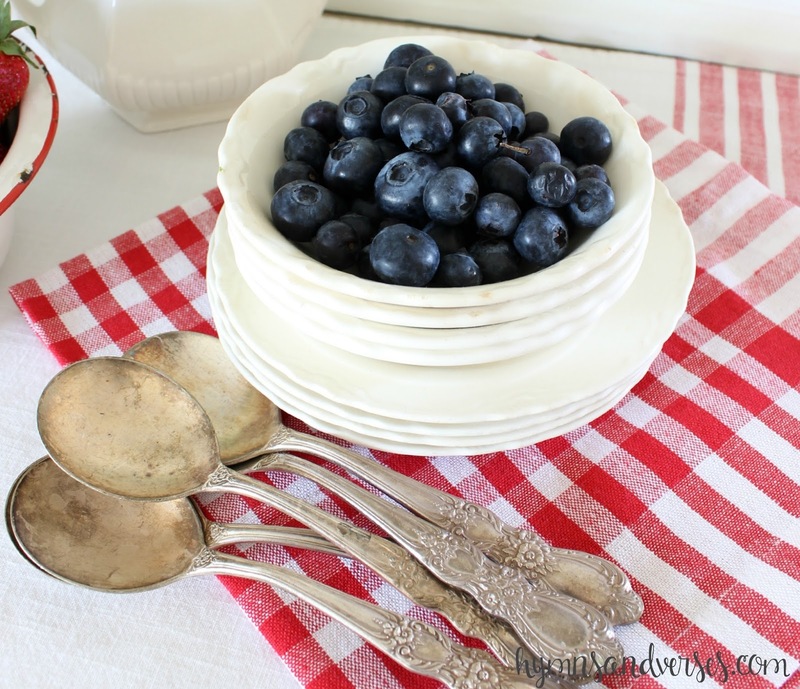 My style is a mix of that country life with a bit of modern mixed in! I hope you enjoy the tour! The barn door sign behind my couch was one of my first projects when I began blogging about three years ago and it still hangs in the same place – it really is one of my favorite things. I found some really pretty fabric with coral and green to make pillow covers to try to highlight my green sofa, but sadly – this sofa just doesn’t photograph well. It is much prettier in person! I’ve been trying to sell it to replace with a slipcovered sofa – if you are local and need a sofa – send me an email! I have a lot of green in my shade garden right now – many varieties of hosta, ferns, and Solomon’s seal. 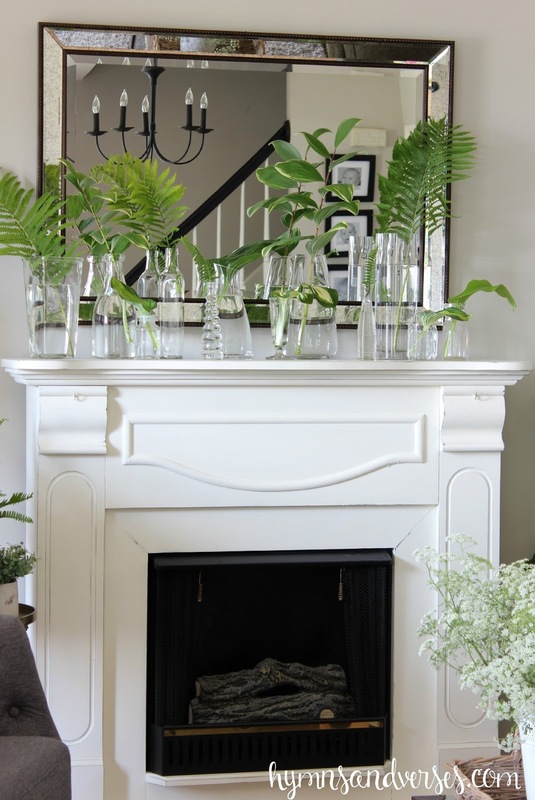 I decided to use some simple thrifted glass vases in a variety of sizes to hold green stems on my mantel. I love how this turned out! 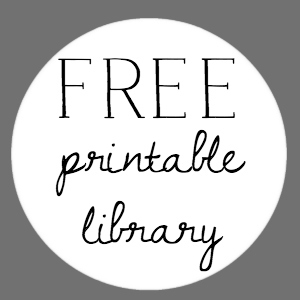 Simple – inexpensive – WOW! 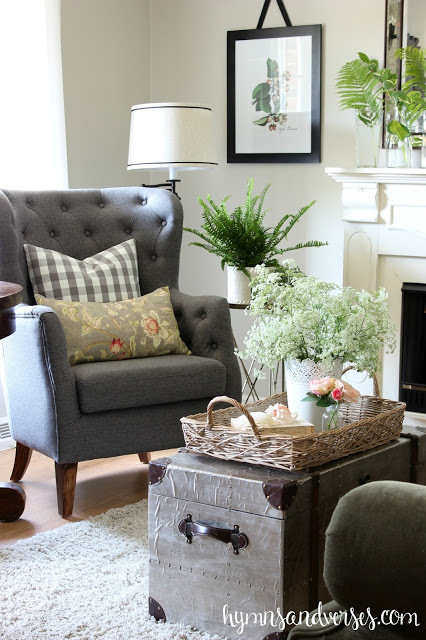 I love mixing patterns and my gray side chairs got a mix of gray check and a pretty floral. Here’s a view of the other side of the room. Yesterday morning I drove down a country road, pulled off, and cut Queen Anne’s Lace to use throughout my house. I had a trunk full (I’m sure those who passed by thought I was a crazy person – but who cares! I had a trunk full of free flowers!) Right now it’s in full bloom here and so beautiful! When I was a young girl, I used to add food coloring to the water and it would color the Queen Anne’s Lace flowers! 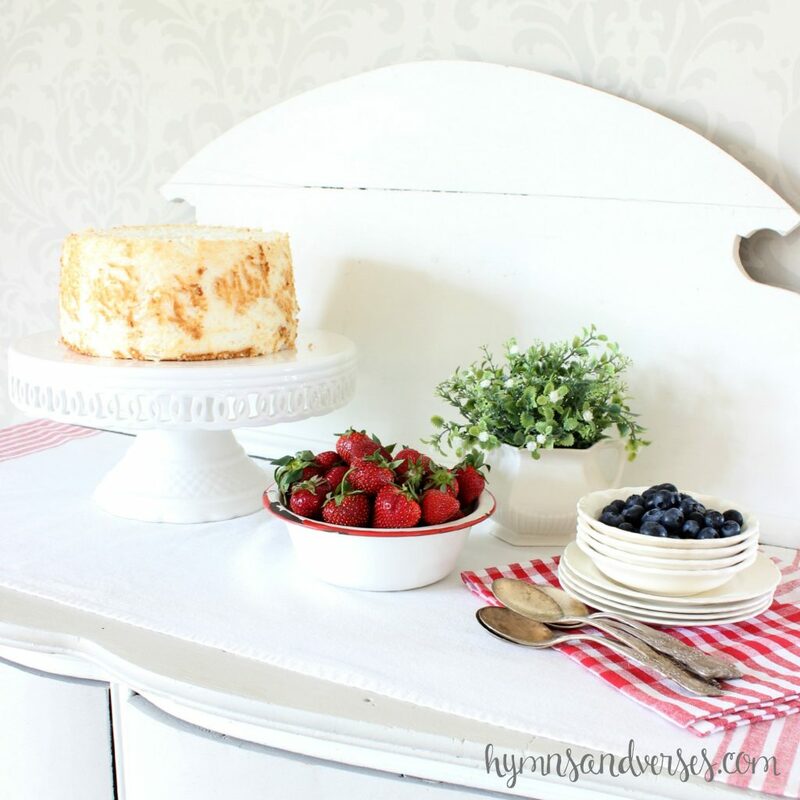 My little cottage sideboard holds a lite, perfect for summer, dessert – Homemade Angel food cake, fresh picked strawberries and blueberries – Yum! I brought a little bit of red into my mostly neutral dining room and kitchen area for the summer. Nothing says summer like a red and white check or stripe! 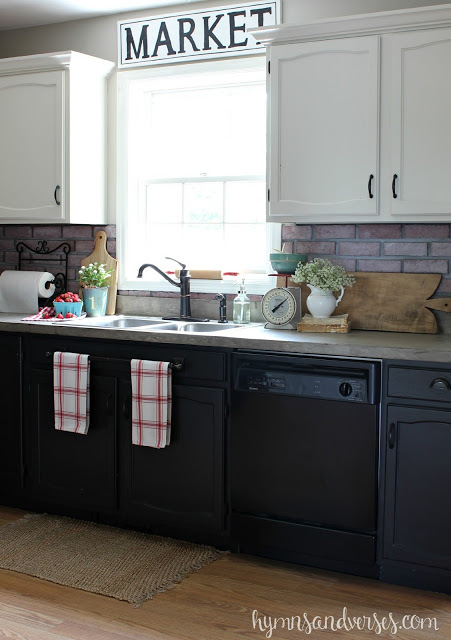 Here’s a shot of my country kitchen. A new addition is the market sign I made. Now onto the screen porch. My favorite place to be in the summertime. Last summer my porch was more bold and bright – you can see it HERE. 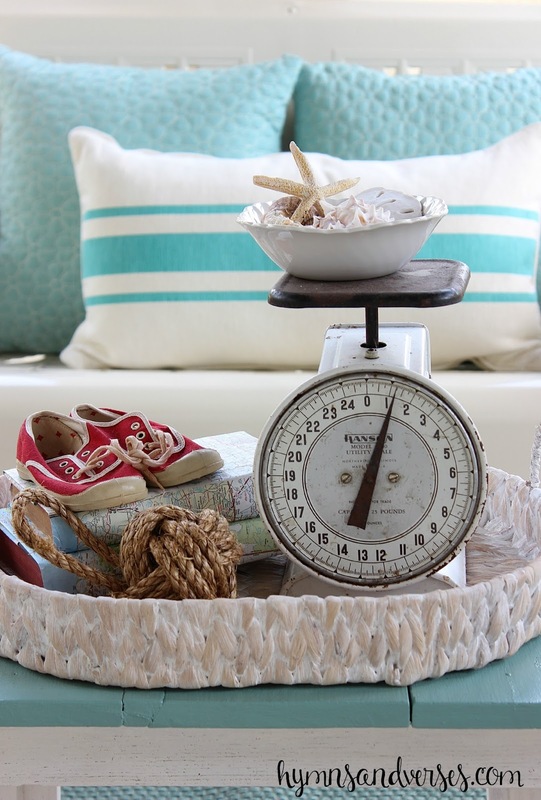 This year, I wanted a more cottage country look with softer colors of turquoise and coral. I hope you notice the fringe trimmed curtains blowing in the breeze (we had threats of a tornado yesterday evening while I was taking these pics!) Lots to share with you later about them! Another little favorite thing – those tiny red sneakers! I found them at a vintage store for $3 and just had to have them – so cute! I shared this little coral table with my readers last week! I found it at an auction, it was dirty, worn out, and a faded blue! I brought it back to life with a good cleaning and this pretty coral color. 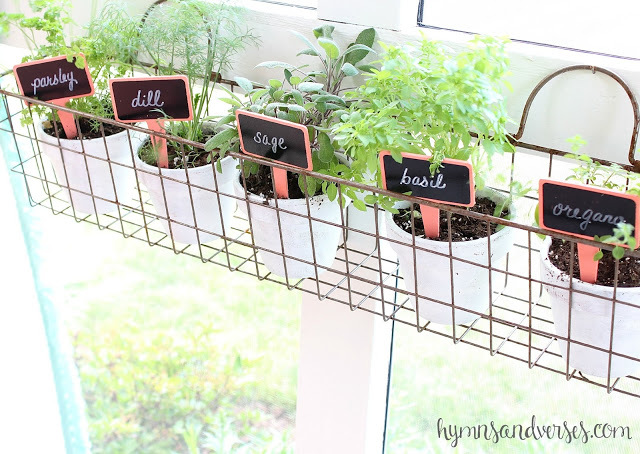 I used these wire hanging window baskets to hold pots of herbs on the two front windows. Can you believe I found the cute coral chalkboard markers at Michaels – a perfect match! 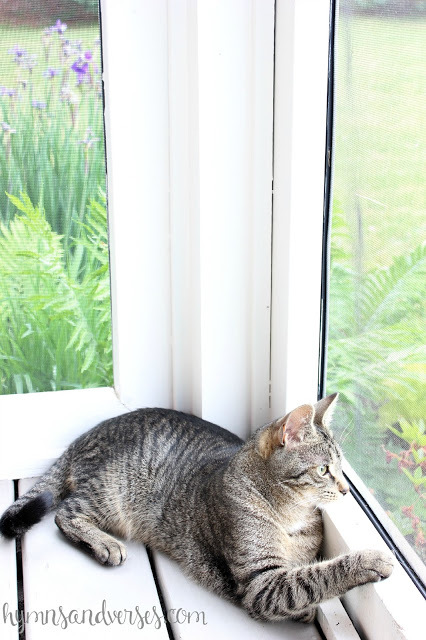 If you are new here – this is the only other girl in my home (I’m a mom to three boys) – Sadie my little cat! She loves being outside on the porch to watch the birds and butterflies! 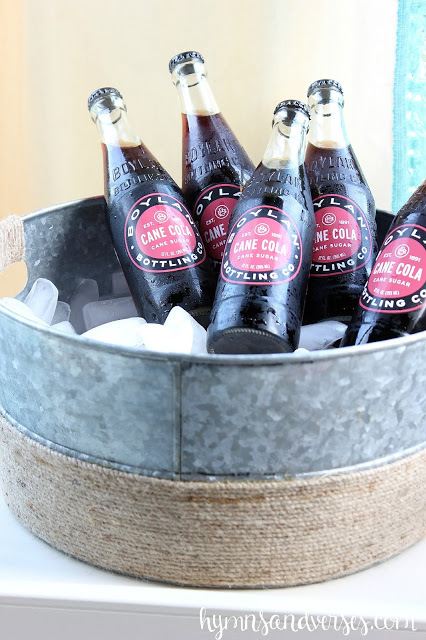 On the other side of the porch is a bar cart that I’ll be featuring later this week! It was another score at a local vintage shop that was basically falling apart! But – now it’s a cool retro bar cart that any Mad Men fan would love! Right outside the porch is this little area. I gave my old door potting bench a fresh coat of paint this year – It was pretty worn out from three years of neglect! I also painted the back door of the garage to match our front door. And, if you visit regularly, you’ll recognize my vintage Schwinn bicycle. I love to bring her out each spring and fill the basket with flowers! That’s all for now! I have more summery spaces inside and out to share with you later on – so please come back! 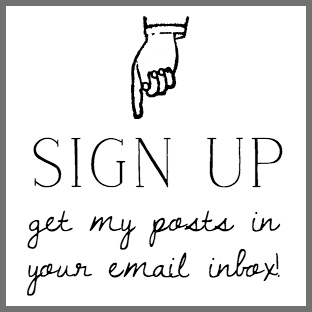 If you are new, I’d love for you to join my email list to have my posts delivered directly to your email – that way you don’t miss a thing! Thanks a bunch for stopping by my country home! I hope you’ve enjoyed your visit! Remember if you liked my tour, be sure to pin it! doreen, your home is lovely! i pinned that fabulous mantle and porch, but the mantle was the highlight for me! 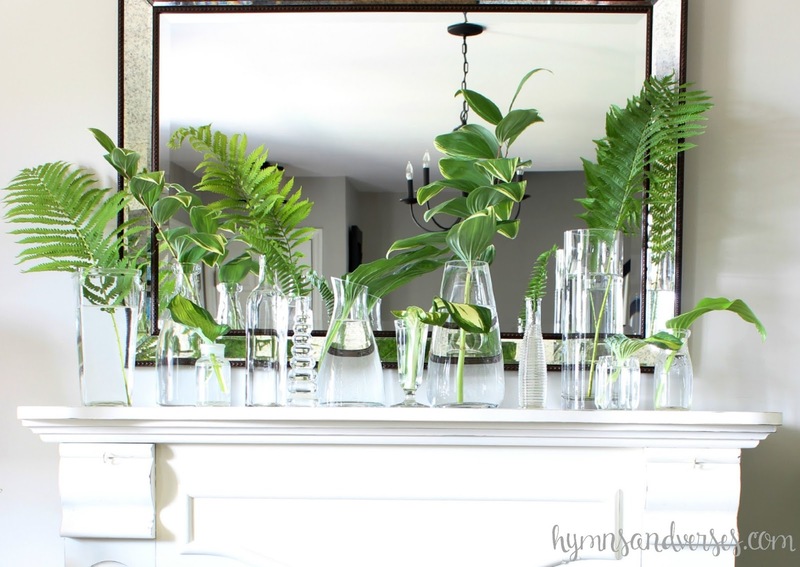 i love the clear vases with the simple greenery. it's so fresh and pretty! Doreen your home is so pretty and inviting. I love how you mix in a touch of country and still remain current. Your dining room just says come in, sit down and let's enjoy good food and company. Gorgeous. It's all so beautiful Doreen, but that mantel make me positively swoon! 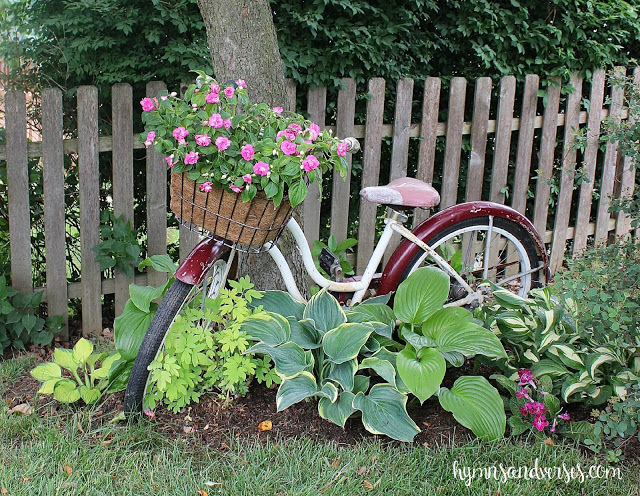 I love your shabby chic style and could sit on that porch for days – it's fabulous!! Everything is so cute, Doreen. 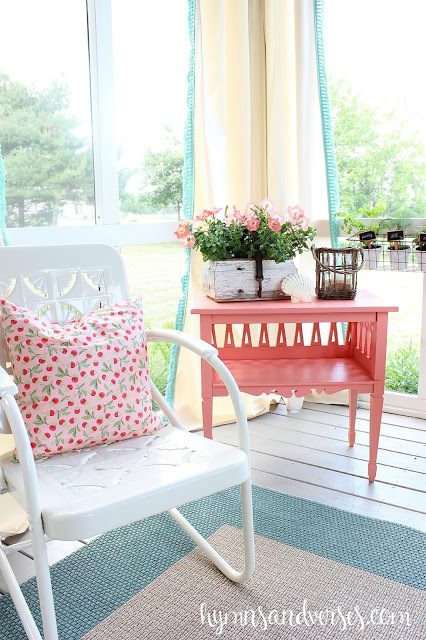 I love all the pops of color and your sun porch looks like the perfect summer hangout. Doreen, I most definitely did enjoy your tour!! Thank you so much for having us over. You are a girl after my heart…love your touch of red in the dining room and the bicycle outside! (I had to pin it!) And your summer mantel display is so pretty and smart. Doreen your entire home brought a smile to my face. I will be sharing your wee red tennis shoes on my Friday "Bits of Bliss" post. Thank you for a wonderful tour! I enjoyed my visit to your lovely home Doreen. 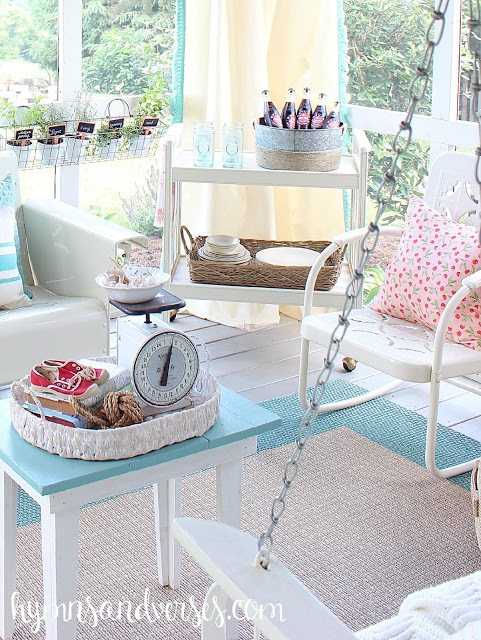 Your decor style is so pretty and your screen porch has to be my favourite spot for summer. 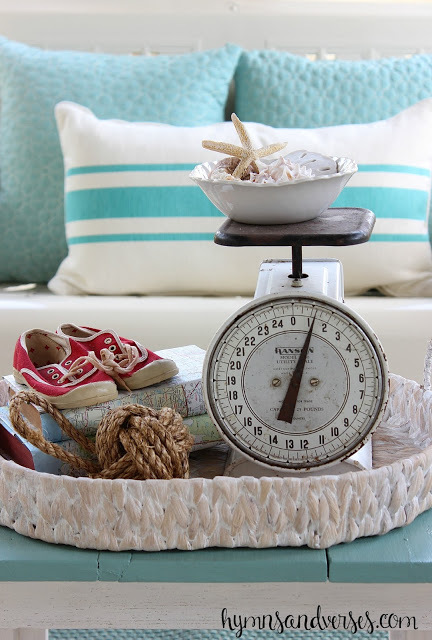 I love the turquoise and coral accents you chose along with the vintage finds. I'd be spending hours out there if I could. Enjoy it! Your home is so beautiful and charming. Thanks for the delightful tour. Beautiful home Doreen….your living room looks so pretty and I love your screened in porch!! So lovely, Doreen! How fun to live so close to a farm like that (without all the work!). I adore all of the greenery you used! 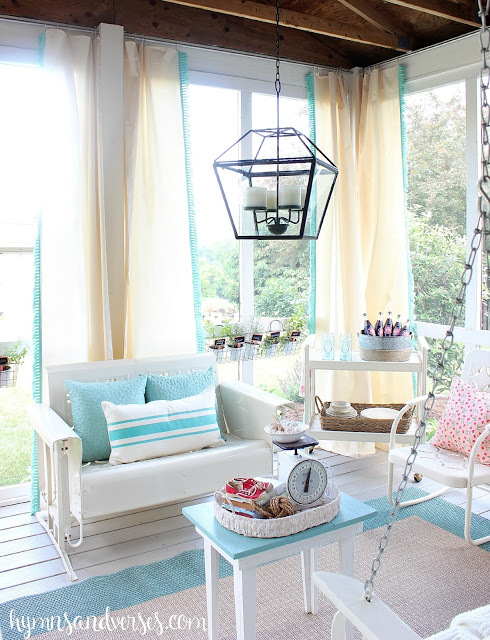 My favorite is your back porch with those pops of color! Your home is lovely, Doreen. I especially like the sun porch and outside space (must be the time of year!) with all the pretty pops of turquoise. Free greenery and flowers are always great and you have arranged them nicely. We had heard about that storm system you folks were getting south of the border. We have had heavy rains and some wind this week but it is a nice sunny day today. Thanks for the tour! Hi Doreen, Your home is lovely and I enjoyed the tour. 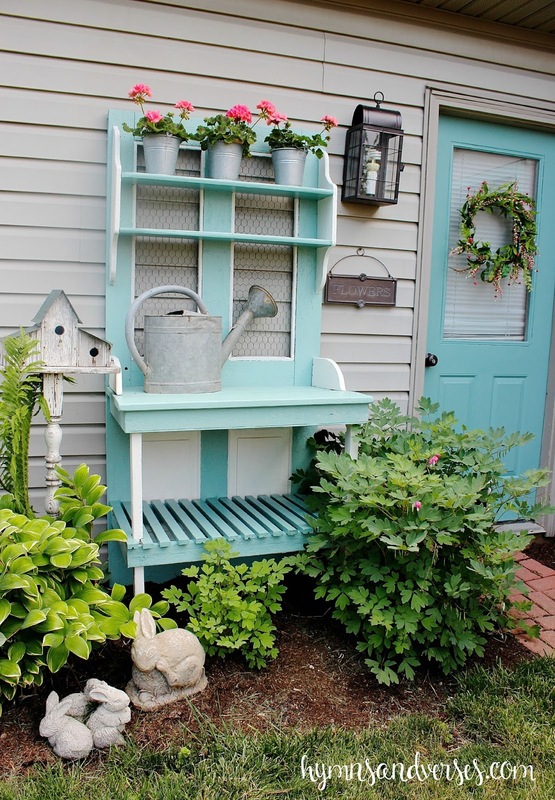 I like the soft colors of your porch and the cute potting table. Just beautiful Doreen! You have such a knack for styling, every vignette is perfection and your photos are gorgeous! I styled my dining table similar to your mantle with a my thrifted bottles, but on a much smaller scale. 🙂 Thanks for the great ideas and lovely tour! Hi Doreen, I loved visiting your home today. I felt very welcomed and everything was lovely! I am curious about your fiddle leaf fig, though. I noticed that it was in a corner. I'd like to switch mine to a corner across from the windows but am afraid it won't get enough light. Yours looks healthy and happy – has it been in the corner for a while? Thanks again for the tour and your fiddle leaf insight. 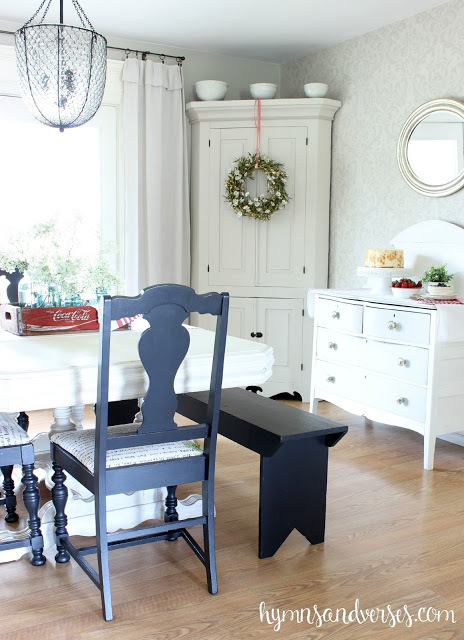 Your dining room caught my eye because of the bench, the old dresser/sideboard, the enamel bowl holding the strawberries, the soda crate, and the scale. I have each one of these items stored away in my garage because my creativity lightbulb just has not shown on them yet. Today, through your example, I can see how beautiful these items can look in my home. My bench was made by my father who went to be with the Lord 9 years ago. The dresser was one of my parents' first pieces of furniture in their seventy year marriage! I just am so excited about pulling these things out of hiding and giving them a new life in my home. Thank you so very much. I am so thrilled to have gone on your house tour today. Oh my goodness!! 1. 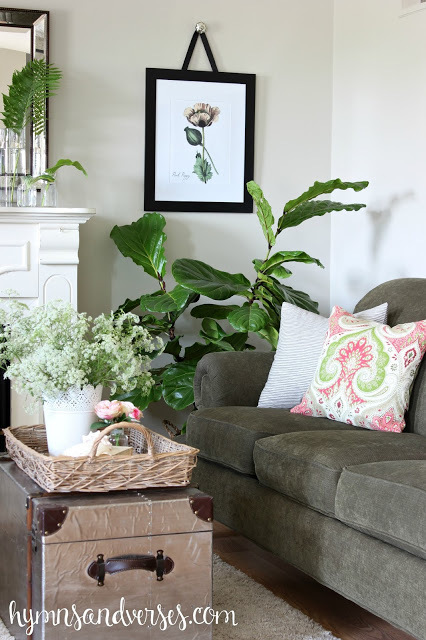 Dying over that trunk in your living room. 2. I would never leave your porch. If that doesn't say summer, I don't know what does!!! 3. LOVE your mantel. Such a fresh (and unique) idea. 4. Are you even kidding with that dessert table???! Drooling! Doreen, your home is beautiful! I love all, especially the porch, I could live all Summer long right there! Your home is so beautiful! I especially love your mantel…perfection 🙂 Oh, and your screened in porch is to die for! Such beautiful photos, Doreen! 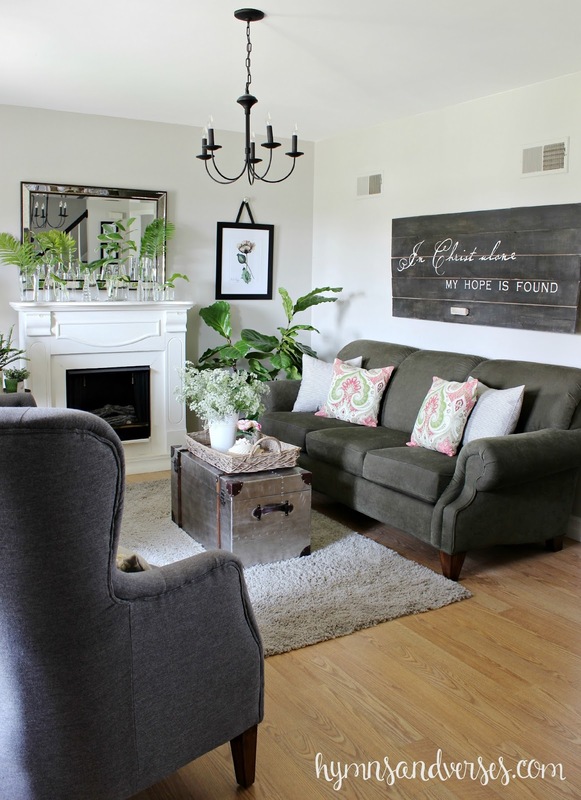 I love your home tour. so many great personal touches!!! 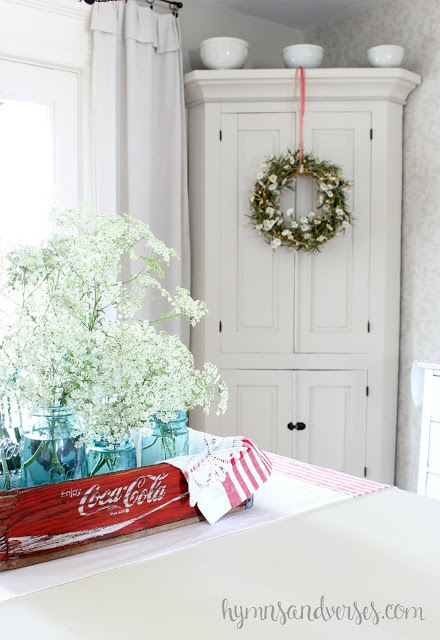 That coke box is just the perfect accent too – loved seeing all of your ideas – thanks for sharing ! Your home is so packed full of charm, Doreen!! It is so cheerful and welcoming…love your style. So pretty. My favorite room is your sunroom. We hubby and I live in Amish Country Ohio. 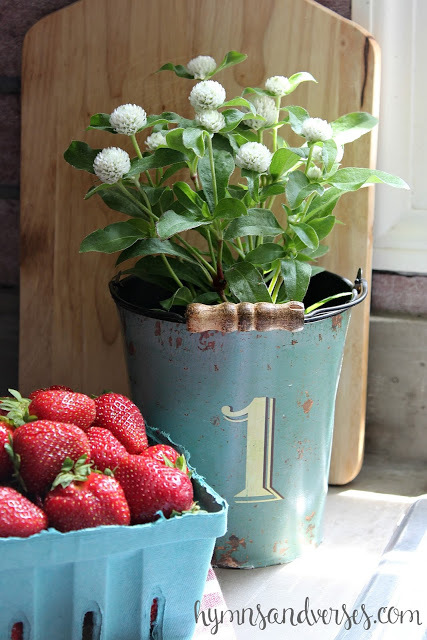 Love all the pretty summer touches you have sprinkled throughout your home. The fringed curtains are so sweet. Your home is just perfect. 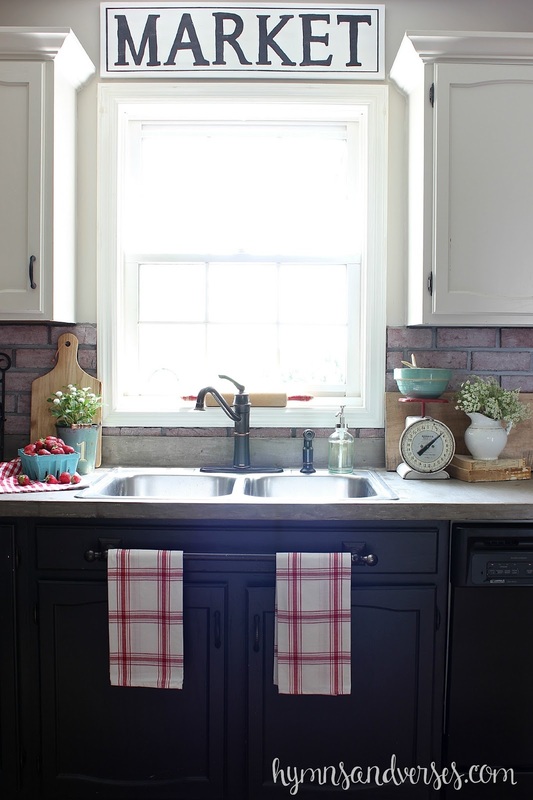 I love your cottage/vintage style for summer. I'm in the same boat as you…want a slip covered sofa! Happy summer! Visiting from Share Your Style! Had to come check out your entire summer tour! Just love it all. You have great taste…and such a beautiful home. Had to pin that gorgeous back porch of yours. So glad I stopped by! WOW, your home is gorgeous! Thanks for the lovely tour and sharing your tips. I've pinned this post and will back regularly! Gorgeous! 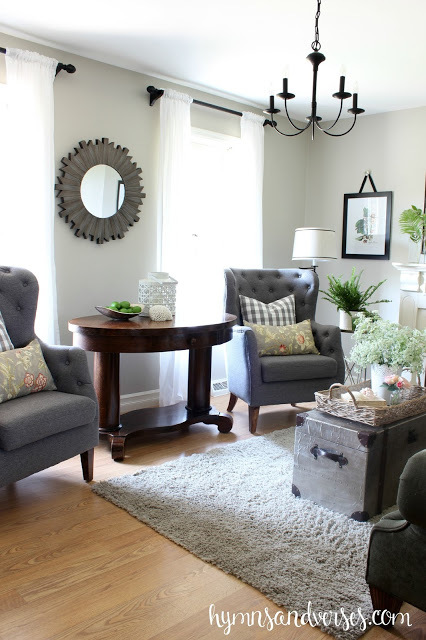 Where are your gray side chairs from? I got them at TJ Maxx a few years ago. I love them too!